Advances in microanalytic methodologies, instrumentation sensitivity, and computational power have enabled the use of fleetingly small amounts of analyte to further stratify individualized molecular information in real time, potentially revolutionizing molecular diagnostics. For example, circulating cell-free DNA has become a promising avenue for molecular diagnostics. The shedding of cellular material into the bloodstream provides a constant source of analyte that can be acquired directly via liquid biospies. Scientists are also turning to nucleic acid analytes beyond genomic DNA for diagnostic purposes. As cells continually transcribe and translate genetic information, the RNA intermediary may be a means of providing profound new insights into the health of any given tissue. At any given moment in every tissue, there is a vast array of RNA expression controlling a complex interacting network of cellular processes. This idea, which could be called constellation diagnostics, goes beyond the usual comparative expression test between tumor cells and normal cells. When a cancer signature (or pattern of RNA expression) is obtained from a particular sample and compared to all other cancer signatures, there is no need for a “normal” signature. 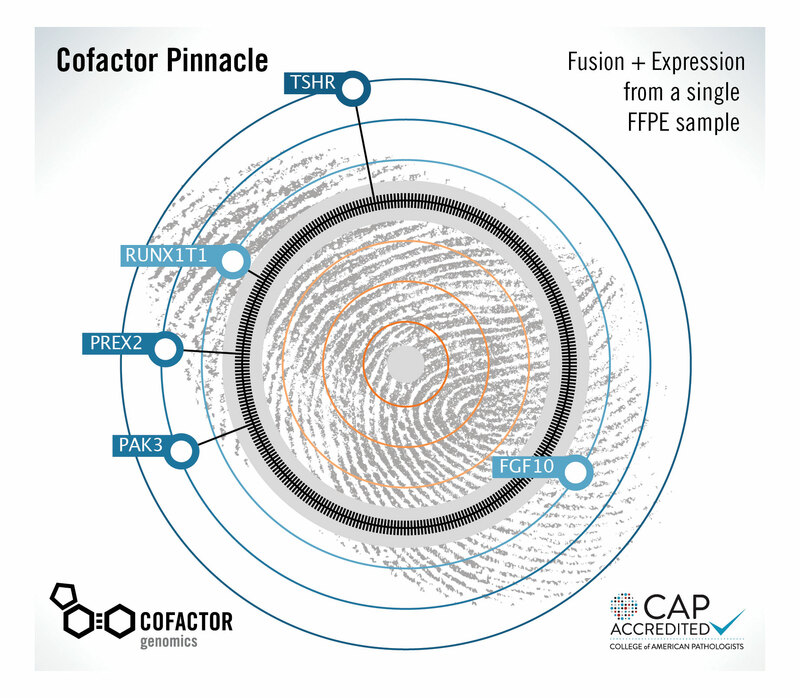 Cofactor Genomics’ Pinnacle expression plot is derived by comparing the RNA “fingerprint” of a cancer sample to hundreds of other samples of the same cancer type. By displaying aberrant genes that make a patient’s sample unique, the plot could lead to better treatment decisions. • Patients naturally prefer noninvasive methods over more invasive diagnostic procedures such as surgery. • Complications from liquid biospy analysis are nearly nonexistent, compared to those that can arise from traditional procedures such as direct lung cancer biopsies. • Monitoring the progress of cancer therapy can be performed much more frequently due to the minimal impact of this approach, providing a better opportunity to change treatment and affect prognosis. Is it possible that liquid biopsies have advantages besides noninvasiveness over traditional tumor biopsies? This question drew from Dr. Jurinke a nuanced response: “Liquid biopsies may potentially contain additional information about metastasis from distant sites, as opposed to information attained only from direct targeting of the tumor. Cell-free DNA, however, is a much more challenging target. It is harder to analyze than genomic DNA taken directly from tissue. The InviGenius Plus by Stratec Molecular is an automated device that can extract cell-free DNA from up to 4 mL of plasma. The large sample capacity enables extraction of more cell-free DNA, which can then be analyzed downstream, where detection methods such as real-time PCR or next-generation sequencing can be used. Cell-free DNA is not only enriching cancer and prenatal diagnosis, it is also being investigated as a potential analyte for trauma and organ transplantation. To explain the rationale behind the use of cell-free DNA in trauma patients, Dana W.Y. Tsui, Ph.D., attending geneticist, Center for Molecular Oncology, Memorial Sloan Kettering Cancer Center, revisits the idea that circulating DNA in the bloodstream may be a byproduct of apoptosis. Cell-free DNA, Dr. Tsui asserts, may also be useful in organ transplantation: “If you think about it, organ transplantation between donor and recipient is essentially a combination of genomes—two different genomes in one body. Monitoring levels of circulating DNA shed from the donated organ may provide an early indication of apoptosis. Furthermore, any changes in the activity of the donated organ will be in real-time, due to the relatively rapid clearance of cell-free DNA from the circulation. “This is a very exciting time for using cell-free DNA as a tool for molecular diagnostics,” Dr. Tsui remarks. “There is a lot of interest in this area as more sensitive technologies become available that can tease out this type of information. Fundamental shifts in diagnostic technologies have also significantly influenced the development of reference standards that can accurately reflect the true nature of a sample, such as the complexities found in cancer. “We’re increasingly looking at many biomarkers in parallel,” says Brian Burke, Ph.D., director of business development, Horizon Discovery, Cambridge, U.K. “This approach helps us understand the heterogeneity of cancer. We’re starting to use multiple analytes—such as solid tumor material, circulating tumor cells, and circulating free DNA—to build a picture of what is going on in the patient. The reference standards can be used to validate biomarker assays. Also, these standards contribute to platform development, helping answer questions regarding sensitivity, reproducibility, and specificity. The idea of a universal standard naturally lends itself to the concept of harmonization between various diagnostic tests. Companion diagnostics has predominately been developed with the view of one diagnostic test supporting one drug to determine therapeutic applicability for one patient. One good example is PD-L1 expression testing for immuno-oncology applications. Horizon Discovery provides genetically defined, human genomic reference standards that can help laboratories ensure the sensitivity, specificity, and accuracy of their assays and workflows. 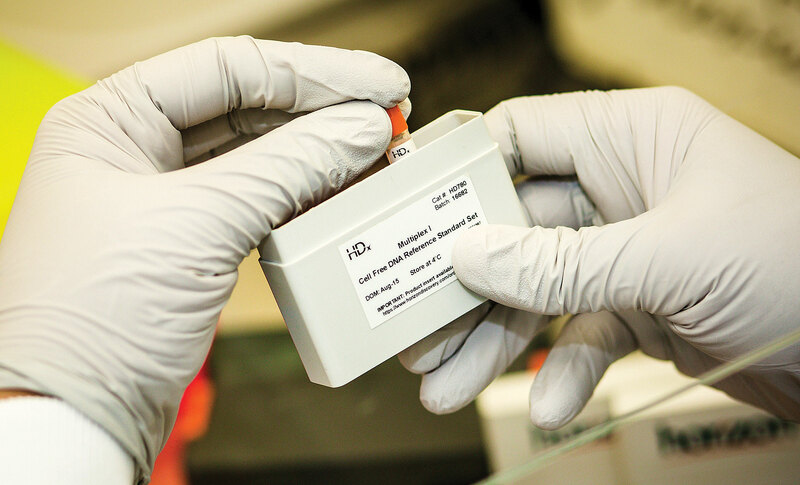 The company’s HDx products include cell-free DNA reference standards. Hemoglobin profiling is an essential technique for a number of clinical research applications, including hemoglobinopathy workflows for the identification of genetic blood disorders such as sickle-cell disease. The genetic defects associated with these diseases result in the formation of abnormal globin chains in the hemoglobin molecule, caused by sequence truncations, omissions, and SNPs during protein translation. Blood profiling analysis must be capable of confident characterization and relative quantitation of both normal and abnormal hemoglobin variants. With over 1,000 forms of hemoglobin reported to date, traditional targeted research screening approaches are unable to comprehensively analyze all molecules of interest on a convenient timescale, according to Scott Peterman, Ph.D., marketing manager, mass spectrometry, biomarker research, Thermo Fisher Scientific. “Furthermore, with so many samples to screen—each one as individual and valuable as the next, it is critical that workflows are reliable, robust, and deliver accurate results each and every time,” adds Dr. Peterman. In a recent research study, a high-throughput hemoglobinopathy routine was developed to quantify normal alpha and beta human hemoglobin chains, alongside abnormal variants, in complex mixtures containing human and bovine hemoglobin. The Thermo Scientific Vanquish* Ultra High Performance Liquid Chromatography (UHPLC) system was used to deliver “superior,” in the words of Dr. Peterman, separation power, enabling confident global protein profiling regardless of sample complexity. “When used in conjunction with the advanced resolution and dynamic range of the Thermo Scientific Q Exactive Focus* mass spectrometer, the method demonstrated exceptional reproducibility for fast and reliable large-scale analysis,” he continues. 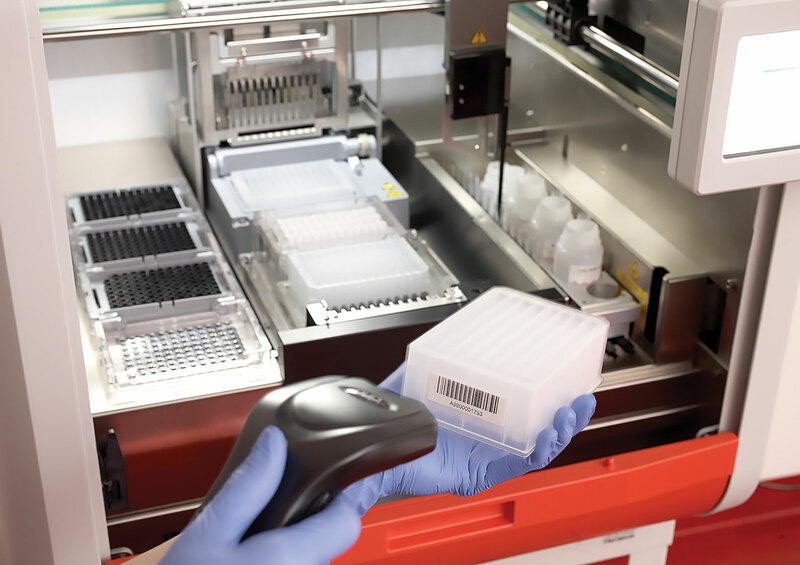 Automated high-throughput workflows capable of handling large numbers of complex samples is essential. The latest advances in UHPLC and mass spectrometer technology are helping researchers understand how they might analyze complex biological samples more rapidly, robustly, and with greater confidence in their results, says Dr. Peterman.